AliExpress, a global online retail marketplace under Alibaba group, is launching its ninth anniversary sale, enabling consumers in Saudi Arabia to shop from over 100 million products at up to 50 per cent discounts. 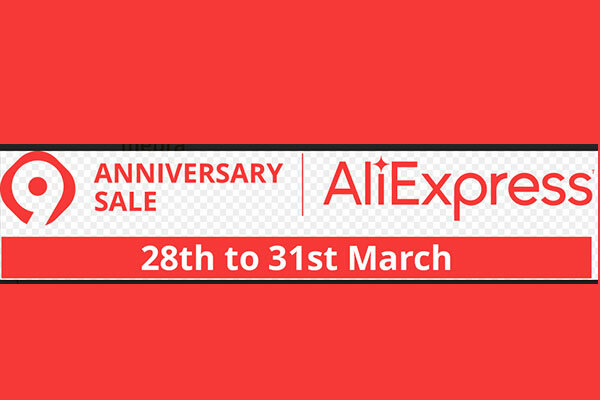 The AliExpress Anniversary Sale runs from March 28 to 31. The sale also brings an improved shopping experience to the buyers in Saudi Arabia by indulging them with multiple shipping and delivery services combined with very tempting and attractive discounted prices. Women shoppers are especially in great luck with a wide range of stylish and trendy products, from apparel to jewellery, watches, furniture and health & beauty products catering to their sensibilities, with the convenience either bought from homes or wherever they may be on the go. On the occasion of the anniversary sale, Saudi’s capital city - Riyadh will transform into a shopping hub filled with pop-up shops, mega sales and smart shopping options. AliExpress is facilitating shoppers to shop from an abundant choice of products at incredibly competitive prices. AliExpress is also enabling the buyers with AliExpress Direct, a premium shipping service developed to enhance the cross-border shopping experience for customers in Saudi Arabia and the UAE. For orders over $90 in Saudi Arabia and $60 in the UAE, AliExpress Direct ensures delivery within 10-20 working days alongside online tracking, door-to-door delivery, and two attempts of delivery available at the disposal of the consumers. AliExpress has also brought the Cash on Delivery service exclusively available for shoppers in four cities of the Kingdom including Riyadh, Jeddah, Dammam and Makkah with a plan to add more cities to the list for more buyers across the country to enjoy and make the most of this service. Cash on Delivery service can be availed by upgrading AliExpress App to the latest version. AliExpress is all set to kick off its first pop-up shop in the Kingdom over three days of the coming weekend where buyers will be able to purchase the sale items as well win coupons for interesting gift prices. The objective of this pop-up shop is to showcase a selection of quality AliExpress products ranging from home goods and electronic gadgets, so the locals have the privilege to physically come around and get a touch and feel of the products.